Well it's about time. My main man Flip has joined Costa Del Mar's current pro staff. If you are a regular reader of the Bonefish Flat, you know I'm a huge fan. The Walkers Cay Chronicles is a big reason I'm such an avid saltwater fly fisherman. Flip won't be squintin' anymore with his new Costas. Flip is a great fit for Costa joining such other pro staff members as Chico Fernandez and Jose Wejebe. 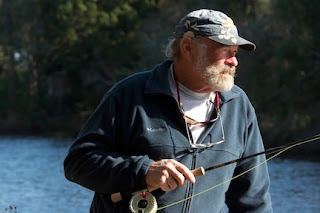 He has a new show, Ford's Fishing Frontier which is on the Outdoor Channel. The new season starts in January. Maybe Costa will come out with a style of shades called the "Flip."